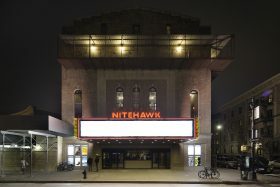 The Nitehawk Cinema will open a second location of its popular theater in Brooklyn this week after two years of renovation work. The theater will open on Wednesday in Park Slope at a refurbished Pavilion Theater, an iconic cinema that was built in 1928 and shuttered in 2016. Dubbed Nitehawk Prospect Park, the 34,000-square-foot facility includes seven theaters and a second-floor cocktail bar that overlooks Prospect Park. 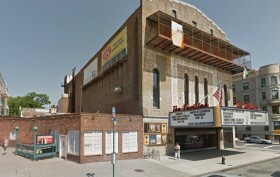 Images on the website of architecture firm Architecture Outfit reveal that Park Slope‘s historic Pavilion Theater at 188 Prospect Park South may go residential. The theater is currently owned by a consortium led by Ben Kafash who purchased the theater from Morristown, NJ-based Cinedigm in 2011. 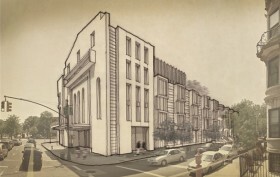 One scheme shows a six-story residential building rising behind the theater’s sublime Moorish façade and from a neighboring lot just south of the theater. It conceptualizes a mix of apartments along the circle dubbed Bartel-Pritchard Square and contextually scaled townhouses along narrow 14th Street. The second scheme preserves the theater in its entirety and limits new construction to the neighboring lot at 190 Prospect Park West where a nondescript one-story building currently stands.